As a visual philistine I always thought of graffiti as mindless vandalism by people with too much time on their hands. Now however having wandered the streets of Shoreditch with Dave of Shoreditch Street Art tours I realise there is far more to it. For the best part of four hours we tramped the streets of Shoreditch as Dave, an enthusiast and limitless mine of information, identified the ‘tags’ on the lampposts and walls, explained the difference between street art and graffiti, described to us the complexities of the street art subculture and something of the rivalry and the camaraderie and the stories behind the paintings. Some of the paintings are astonishingly beautiful, some of them witty, others political – Dave would say they are all political in a sense. But where I saw ugly scribbles he saw the tags of famous (in their field) graffiti artists who, were they to decide to adorn his front door, he said, would be welcomed and honoured. The best of them are created for the particular environment they are in: a protruding twig is painted to look like a snake, a hosepipe appears to emerge from an air conditioning unit. Some of them are ‘official’ but most of them are not, and Dave could tell when a painting was done in a hurry by someone working probably at night-time, in a rush, hoping not to get caught; knowing that at any time the council may come along and wash his art off the wall – though recent budget cuts mean they don’t tend to do that so much apparently, unless there are complaints – or a passer-by might choose to deface their work, either creatively or otherwise (I for one could not spot the difference – see below). The painting on the left below for instance features three different artists: for the muslim woman in the burkha holding hands with the white man the artist had to first get the approval of the local muslim community. The queen’s head underneath the child on the seesaw was added, at a later date by a different artist, knowing tourists would flock to take photos of the boy and the sunset. 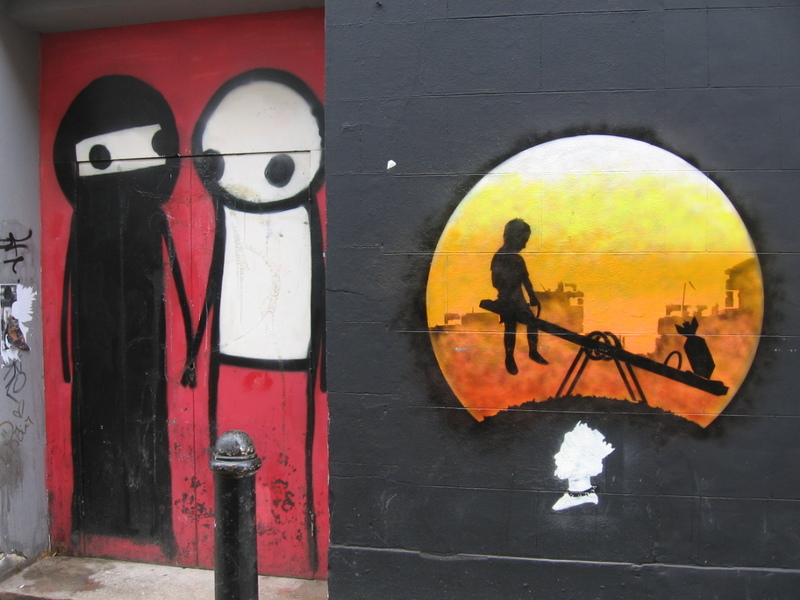 The painting on the right is recognisably by the same artist as the boy on the seesaw. 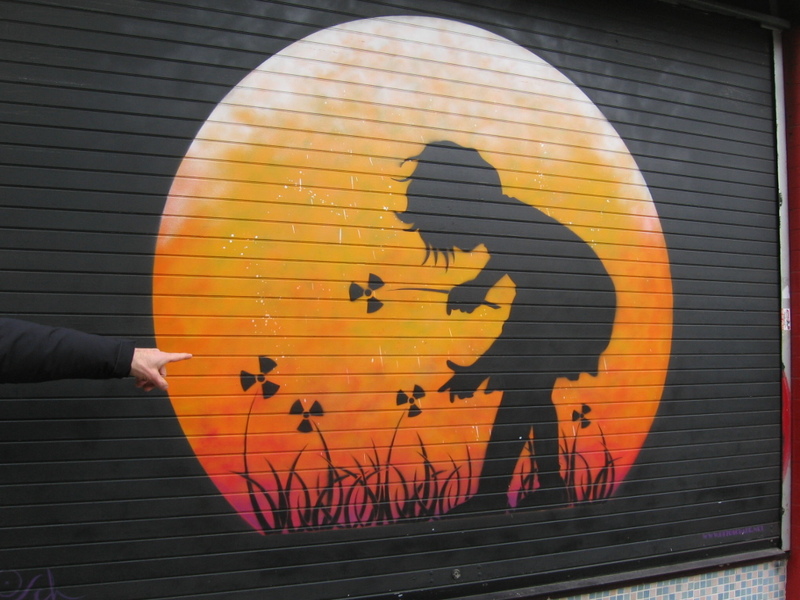 His theme is innocent victims of militarism and war – look closely at the ‘flowers’. This one, of a heart, on what looks like a garage door, was done with a special technique involving a spray can held upside down, or maybe it was backwards, but whatever, it is highly skilled and very beautiful (my favourite of all of them actually). The fox, below, lies in wait with a trap to capture anyone who tries to pick up the ‘money’ lying under the upended ‘shopping trolley’. This one below was painted onto a blob of chewing gum on the pavement. It’s of the local scene and features the name ‘Gary’ – not the artist’s, more likely a passer-by for whom it was painted. The real thing, an actual Banksy, preserved behind perspex. The tour was an eye-opener, for this Londoner anyway. I’ve lived here most of my life but I shall look at my environment with new eyes henceforth. 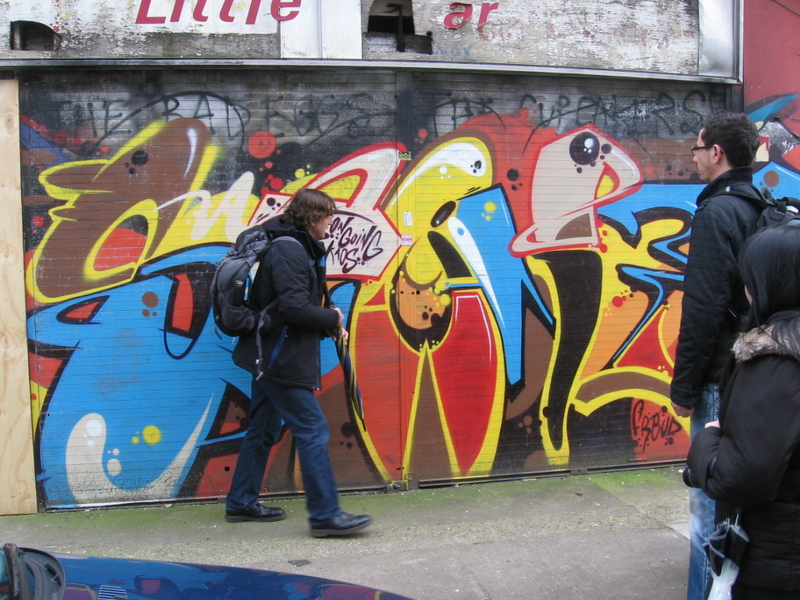 Dave runs his street art tours daily. He also does night tours. Check them out at shoreditcharttours.co.uk. Very much recommended. 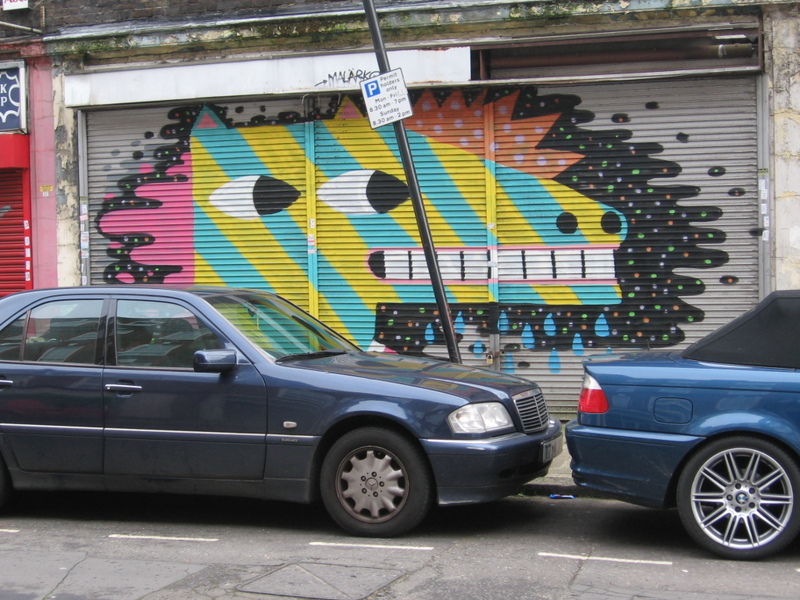 This entry was posted in art, art tours, London, Theatre and tagged Banksy, graffiti, Shoreditch street art, street art. Bookmark the permalink. We participate today in the tour with Dave. It was FANTASTIC!! Dave is very professional with a wide and deep knowledge and he shares it in a very intestine way. HIGLY RECOMMENDED! !